Abckiria (also sometimes spelled ABC-kiria, and spelled "ABC-kirja" in modern Finnish), in English "The ABC book", is the first book that was published in the Finnish language. It was written by Mikael Agricola, a bishop and Lutheran Reformer, and was first published in 1543. 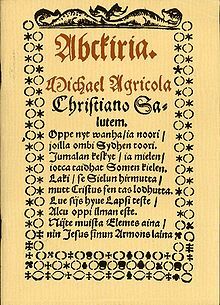 Agricola wrote the book while working on the first Finnish translation of the New Testament (which was eventually finished in 1548 as Se Wsi Testamenti). Abckiria was a primer meant to teach the basics of reading and writing. It contains the alphabet, some spelling exercises, and catechism. The first edition had 16 pages. The second edition, which was written in 1551, had 24 pages. No complete copies of either are known to exist, but general contents of the book have been discerned from the existing material. In 1966 further missing parts were discovered by a librarian and included a new (likely third) publishing date of 1559. The catechism includes the Ten Commandments, the Apostles' Creed, the Lord's Prayer, the first part of the Hail Mary, New Testament citations for sacraments of baptism, confession, and the Sacrament of the Body and Blood of Christ. It also includes grace and the morning and evening prayers based on Luther's Small Catechism and three prayers during the ringing of the church bell, apparently as a substitute to the Angelus. ^ Penttilä, presented by Aarni (1998). Näköispainos Mikael Agricolan ABCkirian eri painosten sälyneistä katkelmista (reproduction ed.). [Helsinki]: Suomalaisen Kirjallisuuden Seura. p. 32. ISBN 951-717-303-2.